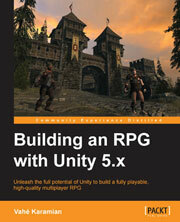 If you have always wanted to create a high-end RPG using Unity, then this book is for you. Prior knowledge of game development is required and experience working with Unity will be beneficial. Unity is one of the most cutting-edge game engines in the world. Developers are looking for the best ways to create games of any genre in the engine. This comprehensive guide on building an RPG with Unity teaches you high-end techniques currently used in developing modern games - the tips, tricks, and techniques can be applied to your own role RPG. We begin with an introduction to, and the fundamentals of, RPG games. Moving further, you will learn the necessary parts of building an RPG, such as structuring the game environment, customizing characters, controlling the camera, and designing other attributes like inventory, weapons, and so on. We also cover designing levels of the game by adding more features to it and making the game more interesting. You will also learn how to get around the obstacle of networking in Unity and be able to implement Multi-Player mode for your RPG games. By the end of the book, you will be able to build upon core the RPG framework elements to create your own game experience. This step-by-step tutorial will teach you how to build a multiplayer RPG. In this book you will explore the core concepts of what typical strategy one might need to build a complete game.